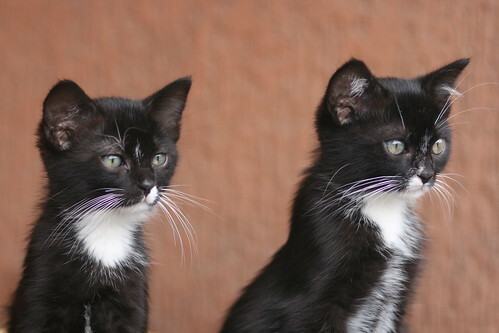 Unlike the kitties to the left, the degree of cerebellar hypoplasia a cat can have is hardly black or white. In fact, one of the more interesting characteristics about CH is how differently it can impact cats, even those from the same litter. Some may be born with severe cases, while siblings may exhibit mild symptoms, if any at all. Since there’s such a range when it comes to this condition, many owners classify their cat’s CH severity based on her symptoms and abilities. The degrees are somewhat subjective, but the videos below will help give you an idea of how the severity of CH in a cat can range. Most mild cats are rather capable. While they may have a funny gait (a high step or waddle), they can usually get around without a problem. Some may even be able to jump up or go up and down stairs. Chances are they’ll still have mild head tremors (when nervous, excited or focusing on something) and random tumbles, but these may not happen often. Moderate CH cats look even more like little drunken sailors. It often appears as if the ground they’re walking on is unsteady, as they walk in a wide stance to maintain balance. Their movements are even more exaggerated, and it will seem like one end of the cat doesn’t know what the other is doing. They often have spastic movements: They may tumble every few feet or their back legs may slip out from under them, but they can still get around. Cats with moderate CH will have noticeable head tremors and usually climb, instead of jump, to where they want to go. Some home modifications, like placing area rugs in strategic places and placing bumpers or padding around sharp corners may be helpful. Below is a fantastic video of Gordon, who was born with moderate CH, but as the video shows, as he grew up he was able to improve quite a bit. This happens often, usually due to building up muscle mass and working on coordination — as well as the brain rewiring itself. Just watch how he runs around when he’s older! Roxy is a great example of a moderately severe CH kitty. She’s able to get up and walk around a bit, but she usually ends up on her side. Nevertheless, these kitties can become quite capable as they often accomplish what they put their minds to. Most severe CH kitties cannot walk or stand. Instead, many may flip-flop around. Shinju, Roxy’s adopted sister, shows how she gets around by propelling herself forward. These kitties may have a bit more trouble getting to where they need to go and when, since they have less control over their movements, but as you can see, it doesn’t make her any less loveable! Severe cats may have frequent head tremors and require extra care. They may need assistance using the litter box or getting to where they need to go. Here’s where this gets cool. As stated earlier, some CH kitties can improve with age. Usually this happens if they can exercise, build muscle mass and move around. Since that can be especially difficult for severely impacted kitties (since they can’t really get up or move too much), their owners have created walkers for them. By slipping them into a harness, the kitty can move around without the fear of falling. This helps severe kitties work on their motor control and also slowly build up their muscles. For more information on the different degrees of cerebellar hypoplasia, check out these great educational materials! If you can, please print a few out and share it with your local shelters and veterinarians. How would you classify your CH cat? Has your cat’s CH improved over time? Have you tried using a walker with your kitty? Please share! ← Is Pet Insurance an Option for CH Cats? Yoshi is 4. He has definately improved over the last year. He even scratches the post like the other cats. He gets stuck and falls over, but he tries. He is even able to jump onto the bed by clawing up the side. I found him on a wooden kitchen chair one day-no clue how he got up there!! Storm is 4 1/2 yrs. old. She has severe CH. She was the one is three kitties that survived. Storm is able to get around by digging her claws in the carpet, and boy, is she quick (as a cat!). Over the years she has improved, but also lost some back leg function due to seizures. I am a member of the CH Kitty Club and have read posts about the walkers, but have not tried one. She has taught us alot about patience, we all loknow she is a special gift from God! My kitty is pretty severe… and she might have other brain damage as well, as she is only nice to me. She is at the end of he life, although she is only 12, it looks like she has cancer, and because she is so hostile to anything but food, love, and pets, treating her is impossible. She had a good run. Lots of love.. food, she loved food. Plenty of comfy beds to sit in. She was found in a dumpster covered with ants when she was a kitten. I’m going to miss Weebles. I’m so sorry to hear about Weebles! What a wonderful life she’s had with you — especially considering how far she’s come! Our thoughts and prayers are with you and her; hope she’s doing well. I have a mild-moderate CH kitten who is about 8 months old now. We think she has some other brain damage going on though as her condition is slowly but steadily worsening. She has head shakes when stressed or stimulated and has recently started having small seizure like episodes when she makes a funny noise and jerks forward as though she’s going to cough a hair ball up. She looks shocked but is OK after a second. It’s heart-breaking not being able to make her better and is particularly frustrating for me as I’m a vet nurse. She manages to get around fairly well. She claws her way up my bed but can’t jump up. The main problem with her is toileting habits. Sometimes she can’t go and I have to express her bladder (she also has Dibenyline to help with this) and other times she pees little bits everywhere. She’s started pooing out of her trays too even though she can get in them fine. She’s hard work but I love her to bits and am so glad that my friend found her and brought her to me. Lilee was dumped and would have starved to death when she was about 12 weeks old. Does anyone else have experience of cats with something other than CH going on too? Thanks for sharing, and while I’m sorry to hear about Lilee’s difficulties, she is VERY lucky to have you as a pet parent! i just found my CH cat in one of my feral colonies. he was dumped—dont you just love some people??? I’m not sure how old Sunny is He is a very thin orange tabby, so far he is using his box unless one of my other cats is in his way.i’ve put thro rugs down and thos eeems to help. he hasisues eating. I keep trying different foods but he will only eat a little with prompting—Is this normal??? He had waht I think is a seizure last night. is there anything i should do otherthan keep him safe and love him. I so woried he might be fading. If you’re concerned about him, I would recommend setting up an appointment for your vet to see him. He would be able to tell you if he has CH or if there’s something else going on. Some CH cats do have seizures, but your vet will be able to tell you more about that. Good luck and thanks for being concerned! Elf seems moderate to severe…She flops over every 5-10 feet, and has head tremors much of the time. She lays down to eat and use the litter box, but can drink standing up because her bowl is next to a wall and she can lean against it. The laser light has been a big help in in her mobility. We don’t let her near stairs, and she really isn’t around climbable furniture. She doesn’t seem to realize she has issues; yesterday she was longing to get out and chase a bird she spied! Try a deep litter box (I use a plastic storage bin that is about a foot deep). My Ziggy has severe CH and cannot walk at all but he does not like to use the litter box lying down. I have to put him in the box and hold him up while he attempts to dig to China but once he is ready to squat he can lean against the side and stay upright while he does his business. This also keeps him from rolling in poop accidentally and has virtually eliminated his getting litter in his eyes! My cat Mimosa is not quite 2 years old yet. My husband and I adopted her from a shelter in July, right after her 1st birthday. She’s very tiny compared to other cats her age and although the shelter wouldn’t absolutely confirm it, they said they believed she had CH. She seems to be mild now. When we first brought her home she was a mess. She could stand to eat and use the litter box but would run into everything and was unable to jump or walk very well. We have noticed an extreme improvement in her motor skills! She’s a curious and feisty little thing who always has something to say. She still makes a mess when she eats, falls over when she tries to look up and is overall a little wobbly but she can now walk in (almost) a straight line 90% of the time, jump up on low furniture, and climb onto pretty much anything. She has just mastered the art of climbing up and down stairs (with only a few mis-steps). She lets NOTHING stop her but I think being able to get out of that tiny cage at the shelter and stretch her legs has made a vast improvement on her mobility. We try to play with her as much as possible and run around with her to help her get more accustomed to different environments and so far she has been doing great! Now if only I could stop her from running into walls I wouldn’t be worried about her health at all! We have a kitty with mild CH named Weebles. She is really only unsteady and wobbly when she’s on a soft surface, like a bed, or if she’s stressed out or in a new situation. She’s actually getting much better now that we’ve adopted her a couple kitty friends to imitate and follow. She’s learned to climb a condo and is much steadier on her feet. She’s a lovely kitty and we’re so blessed to have her in our lives! We have a cat named Sprite with mild CH. She is quite tiny – only 5 pounds but she is the boss! The 17 lb. male cat runs from her. Sprite is 15 years; her motor skills definitely improved over time. As a kitten she would run into doors. She hasn’t done that for a long time. Her jumping is off too. She will jump higher than needed and then come down. She uses her claws to climb rather than jump as well. When she walks she picks her feet up high but she does not have tremors or wobble as others do. She is very sweet and we love having her. Yes! My kitty Chanel is 6 years old and has always had “the gallop” we also call it a bunny hop. She does this when chasing toys but also sometimes for no reason at all she just takes off! This website is great!! I am a foster with three C.h. kitties looking for homes. I have adopted out several c.h. kitties and they are so amazing and unique in their own ways. The three I have now are moderate to severe, I am referring people to this great website for more info with their so helpful resources. Thanks, Katye! I love hearing that you have experience with CH kittens. I’m sure you’ve learned a good deal from them and come up with a few tips and tricks. I’d love to learn more; I’ll try to email you later today. Give those little ones a hug for me! Have you noticed that some days they are better than others? Corbie has ups and downs. Some days she can take 2-3 steps before a wobble but today she falls over while even laying down. On a good note…she learned to lay down and eat/drink. Over the years, we feel he’s improved drastically. We have the random crashes, wipeouts, messy eating and “snowballs” down the stairs that any mild CH kitty owner has, but overall the vet is amazed stated that he looks “pretty darn good”. OMG…..I’m almost positive we knew Gordon. Is he from Hauppauge NY? There was an orange, tabby, CH kitten at Riley’s vet’s office months ago and his name was Gordon and he looked EXACTLY that Gordon. My fiance and I were smitten with him but of course, couldn’t take in another cat, especially a kitten and definitely not one as challenged as Gordon was when we met him. It broke my heart to walk out of there without him because I was highly concerned that no one would want such a challenged cat, regardless of how cute he was. Luckily, we went back within the last month-month and a half and to our pleasant surprise, he had since been adopted. And my fiance just pointed out, that the Gordon we knew also never stopped purring. So either this is the one we knew or God has a very interesting sense of humor. I just checked the video, and it says it was posted in 2007, so it doesn’t sound like it’s the same Gordon. But what a coincidence! And I’m so glad that other little Gordon got a home 🙂 Hope Riley’s doing well! I have a sister who sustained very serious brain damage at birth. Mother was told that she would never function on her own, to which she said “damn the torpedoes” etc. My sister now is a human rights specialist in COBRA. What made the difference for her can help CH cats as well. First of all: to break down every task into smaller sub-tasks. If you are going to train your cat to walk more proficiently, set small goals and give rewards when accomplished. The brain is much more plastic than had been assumed and while doctors usually think in terms of the cerebrum, the cerebellum can be retrained as well. What makes the difference is repetition of correct movement. Just as it was the right “floor” for my sister to spend a couple of years in a “special class”, the right ground for a CH cat is one in which it can gain a clawhold. I have seen a number of videos where CH cats have to try to make do on beautiful hardwood floors – and I understand the greater ease of cleaning up after them on such a floor – but CH cats need all the help they can get, and carpeting is best. When you are going to put your CH cat through the paces, literally, you should give it gentle support under the belly, to help maintain the sense of balance. Proprioception – locating oneself in space – is a sense the CH cat has to be helped to understand. So that one’s daily exercises of one’s cat should provide not just the balance required to move forward, but also the feeling that this is the right way to be. And providing the human touch is very important in keeping the cat calm – you don’t want to stress her because that will make everything worse. The best thing is to get advice from your vet as to how long and how frequently you should subject your CH cat to these exercises. You might also consider working these exercises into their play program – when they are upside down on a flat surface they should be quite calm and relaxed, which is always important in helping the lessons to sink in. Our neighbours once had a CH cat named Plopper – mimicking the way he walked – he benefited from these exercises, and led a long and happy life. Hi, I very much enjoyed reading your website. This has been an extremely difficult day for me as I had to put my sweet CH kitty Oscar to sleep. Oscar was 9.75 years old. He showed up in our yard 9.75 years ago as a tiny feral kitten. I worked hard to make friends with him and finally he joined our family which consisted of another two male cats. His symptons did not appear until he was about 2 yrs. old. He was diagnosed by our vet as having CH. Through the years his symptons steadily progressed. He was such a sweet and courageous little kitty full of love and a very strong will to live. Back in Sept. he was diagnosed with irritable bowel syndrome. After special diets did not work, he was given steriod injections. They helped for two months but then he started losing weight, from 10 lbs. to 7 in about 2 weeks. His CH was becoming severe especially with his weakness and lack of weight and muscle tone. We knew it was time for God’s angels to come get him and I know he is happy and perfect tonight. Our vet said there was nothing more he could do and that liver or kidney failure or cancer could be another problem. He was also tested for his thyroid but that proved ok. I will miss him greatly. He taught me the importance of life even with handicaps. I will never forget him. I am so happy that there are people out there such as yourselves that have given these wonderful cats a good home. I am so thankful I stumbled on this. I have two cats from the same mother different litters with moderate to severe…they usually have the most problems when they go to the bathroom and flop into seizure likes till I give them valuim to calm it down but outside of that this is exactly how my kitties are and thousadn dollars of vet bill and the vet could not tell me what was wrong with them and still wanted to run even more tests. From reading about CH from various websites and listening to my vet, there is no cure. My veterinarian told me that sometimes the symptoms will not progress beyond a certain point, therefore reaching “a plateau”. I remember rubbing the back of my cat’s neck during a seizure which seemed to help calm him down. I gave him soft beds that were easy to climb in and out of. I used dishes that were easy for him to eat from. There were times when he would knock over the water dish so I would keep the water to a minimum level. Carpeting is best so they can have a soft landing after going over backwards from a seizure. I work at a shelter and we had a cat come into the shelter who the ACO said had cerebillar hyperplasia. I decided to take this cat home because he was not getting the attention he needed at the shelter.I am only fostering this cat so I cannot get him checked out by a vet because The shelter would not pay for it. I am beginning to think that he has something else wrong. His front legs are deformed and short and his hind legs when he walks is lake a rabbit. He kind of hops. The other thing is that he dose not know how to eat by himself. I have to set and feed him a little at a time and he drinks no water. He also dose not use a litter box and he dose lay down when he pees. Dose this sound like the same thing to you. Some CH cats do have trouble eating, drinking and using the litter box. Perhaps these links will give you some suggestions of how to help him! Do your CH kitties play? Bunny doesn’t seem very interested in play except to watch her sister. And when she does go for a ball or mousie, she reaches out in slow motion. I’m new to this CH stuff, so don’t know if Bunny is just unmotivated? Or if she is afraid to fall? Or just shy? Oh yes, I know many of our CH kitties love to play, just like “normal” kitties. It sounds like Bunny’s still shy. I’d give her lots of time to acclimate to your home – several weeks if possible. Remember, this is all new to her, so I’m sure she’s very nervous. Some cats acclimate faster than others, so you have to go at her own pace. Good luck! I’ve corresponded with Amanda about my mild CH kitten, Dimity. She’s only 4 months old at the moment, and the reason she was diagnosed is that she has the high-stepping gait, and is clumsy. But the news is that she is gaining in strength and development! She still walks funny and runs like a bunny, but she’s begun to JUMP! Not smoothly and elegantly like a normal cat, but still! And if she jumps down from a not-so-high place, she can often land on her feet, rather than doing a belly flop like she used to. I know that this is a lifelong condition, but it seems like they can still learn skills? Now if we could only conquer the litter box, LOL!! We have a 7.5 week old kitten who is having trouble eating/drinking and tremors. He is at the vet being monitored because he will not gain weight. He was eating fine last week and then stopped. They think he may have CH. I am devastated to think I may have to feed him. I love animals and we have 2 dogs and 1 cat already. We had 2 other cats who died unexpectedly last year because of tumors and cong kidney disease. I am reading some of these stories and do not know how I am going to do it again if he does not eat or drink on his own. We love him yet I cannot devote all my time to him because I have kids also. I am having a heart struggle right now. I just came across this site…what a wonderful resource! My CH kitty, Forest, is 9 1/2 years old. When we adopted him, little information on CH cats was available. Forest has mild to moderate CH now, but he was moderate to severe when we adopted him. At first he could barely walk…his back feet would get out of sync with his front and he’d give up and just pull himself around. It’s been a long road, but now he runs all over the house, goes up and down stairs, and can even climb up on the back of the couch. (It’s not all that graceful to watch, but still…) he’s even learned to control his head tremors. He’s the strongest cat I’ve ever seen and the undisputed dictator of our house. Everyone who told me “what do you want that cat for” is now totally in love with him. If you have enough patience and love they definitely can improve! Forest sounds like an absolutely amazing cat! Would you be interested in having him featured on the blog? You can find out more by hovering over the “Readers” link above 🙂 Thanks for commenting and hope to hear from you soon! I live in South Africa and have a foster kitten with severe CH. I am wondering if it is fair to keep her alive if she cannot even pick up her hind legs to move around? Anyone with a severe CH cat who can give some advise? Thank you for your comment and question. Many folks in the CH community believe that cerebellar hypoplasia should not be a death sentence. That said, a severe CH kitten does come with her own challenges. How old is the kitten? How long have you had the kitten? While somewhat less common, cats with severe CH can have a high-quality of life. That said, there is an increased amount of responsibility put on the pet parent to accommodate the animal’s needs. For example, some CH cat parents diaper their severe CH kitties, since it can be difficult – or impossible – for them to get to the litter box. Little changes like these can make life easier for everyone. If you’re struggling with this decision, I’d suggest chatting with your vet/shelter. I’ll also chat with my community to see if there are any other suggestions we can provide. Good luck! My kitten, Annie, is a mild CH kitten (we think). I’m a vet nurse from Melbourne, Australia, and none of the vets I work with, nor the specialist, have ever seen one before. Annie, and her brother Oliver, were brought in to my clinic when they were a day old. Annie was so tiny she still had her umbilical chord attached, she weighed 70grams, Oliver was a bit bigger at 90 grams. (Sorry I don’t know the conversion) At 2 weeks Oliver was starting to toddle around happily but Annie was struggling, she couldn’t coordinate her movements and would fall on her side or face plant into the ground. Nothing would stop her though as she was determined to keep up with her brother! Annie and Oliver are 18 weeks old now and Annie is doing great. She’s wobbly and still tends to fall over especially when she looks up at you but all in all she is a happy, playful, cuddly, kitten made all the more special by her condition. Hi everyone! I have two CH girls, Maggie and Molly (first named Margarita and Mojito). They are five year old sisters; 7 and 9 lbs. They were about 4 months old when I met them. They were originally rescued from a shelter that would have likely euthanized them. Maggie is a DLH (calico) and Molly is a DSH (lynx point Siamese) – different dads I suspect. I already had four cats and couldn’t picture more, but I fostered them for some time before I gave in and kept my babies. At adoption events, the “lookers” exclaimed about their beauty, but just couldn’t accept the “disability”. Best decision I could have made was bringing them home for good. They are mild to moderately affected. Both do very well with the litter box, get along with my other cats and my Springer Spaniel, and don’t have a clue in the world they are different. Maggie has a very wide gait, and Molly slightly rotates her head when focusing on my face when I talk to her. Maggie gets the little head ticks sometimes, but they go away as she settles. They love to play as much as any other cats. Chasing the laser light, and fishing are their favorite games. I had a lot of new tile in my home before they came, and now I have carpet runners covering all the tile. They both over-jump their targets, and Molly does the wild galloping, which is a hoot. She may look hilarious, but she covers a lot of ground fast! Little Maggie is the house boss! The Alpha cat. At bedtime, she jumps up in bed with me, puts her paws around my face and starts kissing my mouth. It’s a bit wild, but it’s her routine and I can’t deny I usually love it. I’m her chosen one, ha ha. We literally sleep cheek to cheek – she purrs me to sleep. My teddy-cat. No matter how much I toss and turn at night, she stays right with me. These CH cats can teach us so much about overcoming challenges and not griping about the “small stuff”. I love all of you who love your CH kitties!! One time my dad came over, saw Maggie and said, “oh, what is wrong with her?? ?” I was stunned; it’s like I’d forgotten she wasn’t perfectly normal! You know how cats are really good at hiding when they are sick? I took in a stray who had 6 kittens, and one of them has CH. I kept two of the kittens. the one with CH went to a good home. One of the ones that I kept, has started showing problems. (head tremor thing, with a weird run, play look. back legs look like they have issues, and she’ll try to walk while she tries to sit down.. or so it looks like). But the funny thing is, She always stayed back from everyone else, even when the kittens would venture, she wouldn’t. I started to believe she was blind because she wouldn’t move much, and when she did, she seemed to have sight issues (now i believe it was her having coordination issues). But she seemed normal, then it was just one day she came out of her shell and started playing and pouncing me, that I realized she could see, and that she had a more severe form than her brother had. But she hid it well. My fiance and I are new to CH. Our kitten Socks always had something off about him since he was a kitten (at first we thought he was blind, but as he got older it was obvious he could see) Then as he got older we became more curious but as he learned to walk better and was doing all a normal kitty should (minus the growing part and such) we figured he’d be alright. I actually just did research and can definitely say Socks is a CH kitty! However it doesnt change how we feel about him and we’ve already started giving him special treatment long ago. Its nice to know what it is though and how we can make things even better for him as he gets older. Thank you for your very helpful site. A little cat has been abandoned in my garden and I think she might have mild CH. We are off to the vet’s tomorrow but I would like to know: have you found that your cats lose their balance more easily when they are looking upwards? When she is looking up at me, watching me carry her food bowl, she falls over a lot, whereas the rest of the time it’s much less frequent. hi there, i’ve rescued a kitten that appears to have HC. i’m researching as much as i can to avoid costly vet bills for diagnosis… apart from the drunken sailor walk, wobbly head, and inability to jump, she is deaf and when she is going places she’ll turn around a few times. she can see but she can’t track things that are thrown in front of her. are these symptoms still within the range of HC? My chest kitty’s name is Mr. Wobbles. My cat gave birth to him and we noticed that he was not getting around as well as his brother and he was growing much slower than normal kittens do. To this day he still has yet to reach the size of a normal adult cat. My Wobbles is almost 4 years old now and he has extremely severe ch. He cannot walk and he is in fact blind. Many doctors believe that his eyes are affected by the ch as well. has his eyes look like there is a silver drop that is attached in front of the retina. It is very difficult caring for a cat with such a severe case of ch. But he is my baby. Since he was teeny tiny I have hand fed him every day and given him water by hand as well. He can’t use a litter box due to the severity of his condition either so it really is a messy job. But he is the ultimate lap cat. He has a piece of my heart that can not be replaced. I’ve never found anybody on the Internet or otherwise with a cat remotely close to the same condition as my Wobbles. Sarah – you have a good heart, like everyone who will love an animal regardless of its age or condition. What you think of as a silver drop probably is the light reflecting from a cataract. These aren’t confined to old people – anyone, including newborns, of any species with our kind of eye, can develop cataracts – which are thin deposits of calcium where they aren’t supposed to be. And for anyone wondering whether this condition can be treated: in cerebellar hypoplasia the cerebellum does not develop fully. When the cat is born, it has to make do with what it has. That also accounts for some cats’ conditions being much worse than others’. bluemlein, Sarah, I have Mr.Dutch Van Weebles!!!!! He is going on 5 now and when we got him he was so tiny, maybe 4 weeks old.? A friend found him in her bushes and of course brought him to me. I’m a sucker for rescues!!! 🙂 (Just ask my husband) lol We took him in and when strong enough would do the “drunkin cat walk”. At first he was pretty good about getting around and getting to his bowl to eat (with assistance). It has now progressed to him being almost completely immobile, we have to manually express his bladder nightly, we made a sling chair to feed him but it isn’t always easy. On a few occasion he has literally been chocking and I have had to hold him upside down for him to gag up. He is ALWAYS on pee pads for when he poops, which is kinda predictable after 5 years. He has head tremors daily and looks like he’s “somewhere else” for a lack of words. My BIGGEST concern is he BITES!!! Always has. He has bitten me more than a dozen times (Bad) He has bitten himself too! Last year I woke up to a bloody mess all around him. He had chewed his paw down to the bone!!! I was terrified and immediately took him to my vet of 11 years. My vet thought he was going to have to amputate but after much discussion we decided to take an aggressive wound care route first. And thanks to God it worked!!! But now he has done it again! We have had to put him in his cone regularly to keep himself from chewing. This time it wasn’t (as) bad but still needs wound care. He is now in his cone all the time and I can’t stand to see him this way. I took it off for 5 mins and he attacked his paw leaving puncture wounds. I don’t know why he is doing this but I can’t seem to bring myself to reality. I wonder how he can do this? It has to be painful??? He is on pain meds and antibiotics currently. He just gets really intense sometimes because he can’t scratch himself if he has an itch. I will see him trying to and I will fill in but the he will bite his blanket like he can’t stand how (good)? it feels. He is My Baby and I can’t imagine letting him go but I need advise? I know with all the love the humans of CH kitties give their furbabies, they are probably content with their life… but my lord is it heartbreaking to watch these kitties try to get around. I just got my kitten a 3 weeks ago and barely noticed the funny walking he’s about 2-3 months old and may have moderate ch, if I start exercising him now could his ch go away? And how can I exercise him? My cat Mango is 11 months old. He looks to have mild ataxia. He walks low to the ground with a very wide stance. He flops when he goes to lay down. He lands very heavily with no feline grace. He’s a bit clumsy and is afraid of stairs. That said he is one of the most loving cats I have ever had. I would not trade him for the world. My 5 week old kitten began walking and falling over a lot like the cats in these videos. I took him straight to the vet and found out he is blind. He might just be disoriented because of they blindness but it may be something more. I am wondering are any of your cats with CH also blind? I found out about 2 months ago my CH kitten is blind too. I found her wandering in the middle of the street; I had to rescue her. She had a funny way of walking, never mowed (I mean, never ever) but her eyesight was still good then. But it gradually became worse. I only noticed when she underestimated the stairs and fell down. Took her to the vet and he confirmed that she’s blind. Now she doesn’t go up the stairs anymore. As she gets older (she’s now 6 months old, I rescued her when she was 3), she has progressed from a mild to moderate CH, plus she’s blind. Well, she has learned how to meow now, which she does when she’s in distress. She is not interested in toys after becoming blind. I worry about her and I wonder what I should do to make her life better and more comfortable. Any suggestions? Moose is 6 and has improved steadily over the years. He still wobbles and only wants to be on the floor or couch. He can now jump onto the couch. He is finally learning to purr, we are so proud of his little “spit” sound because it is definitely purring! He has gotten so much stronger and no longer looks sort of atrophied at the back end. He used to walk on his back “elbows” but 2 years ago he got onto his feet and now walks really tall with his legs really wide. He is a goofy fellow, but super loving and smart! He is a joy to our family. we have a 2 year old male CH cat named wobbles. he has a mild case. gets around easily when walking but when he starts to run around things get real tense because his back end tends to get in front of him and he’ll endup t-boning a door. he’s a very happy cat and doesn’t seem to be aware that anything is wrong with him. and he is so loving and affectionate. he’s on my lap whenever i’m sitting or laying down. it can be a little much sometimes but i’ve never met any cat as friendly as this guy. there is a problem though- he obsessively licks the hair off his tail. i’ve checked his tail and there are no wounds or irritations, no fleas or bumps, or rashes. his tail went from a full fluffy tail to a practically hairless tail. it looks like a rat tail now. i’ve tried that bitter apple stuff and the spray thats supposed to stop them from chewing on things but this cat loves that stuff. i’m wondering if this is a common problem with CH cats? i’ll likely take him to the vet this week. Hi: I’m hoping this website is still active and can get some feedback. I have a little guy, Loki, with obvious neurological issues. He has nystagmus and head bobbing and other obvious symptoms of mild CH and a very deformed tail. It is bent in the middle like a zig zag and is a knot in the end. When I adopted him at 7 weeks, it was obvious that he had nutritional deficiencies, including rickets. His front legs were bowed out like a bulldog. I started him on high doses of vitamin D3 (1,000 iu daily) and kitten formula with added colostrum for the first 4 months that I had him. The rickets resolved quite nicely. He has lots of litter box accidents, it’s like he forgets where the box is or is lacking the nerve signal to his bowels and bladder that give him the heads up that he has to go and when he does go, he’s no where near the box. But I’ve seen the little bugger actually seek out a corner in the room or make a beeline to a previously soiled area to make that his destination to evacuate. I’ve started confining him to the smaller bathroom after meals where the litter box is and have been mildly successful. He gets around easily and chases after the other two cats that we adopted at the same time (from a different litter) as kittens a year ago. But he has given himself several concussions from running head long into doors and this has impaired his vision but not slowed him down in any way. I started giving him arnica 30x after the 2nd head long crash after I noticed that his pupils weren’t constricting in light and since his vision is poor and he now regularly bumps into things I’ve been giving him arnica 30x and gelsemium 30x every day for the last few months to help with the concussion(s) and his obvious nervousness (or maybe related headaches). I’ve noticed that the gelsemium has made him more social as well as my 10 year old feral rescue, Patches, who is seeking me out for cuddles daily now. Are there any supplements or other homeopathic remedies that I might explore for my little guy? We appreciate your site. Our Petie was dumped at a feral site with two normal brothers at age of two weeks on a 13° day. When I fed the site, I found them in hypothermia and put the three inside my coat and shirt while driving five miles home. Petie has become “moderate” and is now 7years old, but has lately become more unstable in the hind quarters. I have a fairly powerful cold laser I use for my own back and hip, and have started giving Petie a treatment daily along his back, hips and back of head and neck. He seems to improve after the tratments. Is anyone else using cold laser on CH kitties? Any other types of treatments being tried? I am lost as to what to do. My parents cat is now 3 years old. He’s the sweetest most incredible little kitty. After we got him, he started having symptoms at about 6 months old, but didn’t become really severe until about 10 months ago. At first I thought he was just born with a physical deformity because his legs were bent inward, but then I started noticing the tremors etc. He is now almost 4. He has all the basic symptoms you guys describe like can’t walk, head tremors, And looks a lot like the video of the severe kitty in the video…but our cat also has more severe symptoms that make me confused as to what his diagnosis is. It almost seems like his brain has become more damaged with time as well. He seems like his vision is impaired, he’s forgotten how to clean himself entirely, and doesn’t really move a lot at all except when he panics and flails around. It’s all very sad. My parents go above and beyond for him holding him to use the bathroom, bathing him constantly when he poops on himself in the night, and they don’t get any sleep because he cries a lot in the night when he needs to reposition. They’ve even changed their schedules so the cat is never home alone at any time. I cannot imagine his quality of life is good, and I’m told by the vet that we need to do lots of expensive tests to get a true diagnosis and even then there’s probably nothing that can be done. Me and my siblings think it’s time for him to be put down , but it’s hard to talk to my parents about it. The vet suggests it as well, but I don’t want to make the wrong decision. Not sure what to do! Any advice ? We have a 3 month old kitty with what seems to be moderate CH. He actually gets around pretty well! I’m wondering if CH affects their control of their bladder/bowels? He seems to know when he needs to use the litter box. But if he gets really excited or startled he will pee on the floor. Sometimes there will be a trail of pee leading to the litter box. 🙂 I was just wondering if he has full control of his bladder? I’m sure it takes him longer than normal kittens to learn to use the litter box. And I’m guessing that once he gets older and not so hyper it will get better. Hello, I’m not sure what’s wrong with my cat. It seems like she has was the kittens above have, but she seems sick. She won’t eat, she only drinks, but only a little bit. And often when you pick her up, or when she tries to lift herself up, her head wobbles like she can’t control it. WHATS WRONG?? I just found out the kitten that adopted us has CH and We are pretty sure she was born feral. My question is does CH cause excessive hyper activity? She has times, especially at night, when she can’t seem to control herself and runs around chaotically then will stop on another one of our pets and start biting them. Our other animals seem to know she’s not quite right and will watch her and then give me a look of concern and I tell them just let her have her moment. When I try to calm her down she gets really aggressive trying to get away. Is this a behavior caused by CH or is it because she was more than likely born feral? i wonder sometiems if my bby mingon might have been biorn with that only a verry mild case mingon was a slow bloomer he wouldnt or couldnt walk untill he was nearly three weeks even then he fell alot trying to keep up with his older foster siblings and was tiny compared to his surviving litter mate Mingion was dumped at my feet in the heat of sumemr june2014 by our feral Bunny named for the distinctive way she moved when running she was sent to a farm becouse she is black and to many redneck idiots tried to run her over she also had issues with climbing anyway when mignon was 8 weeks old he came down with an illness my vet couldnt or wouldnt name and he basicly gave up on him i took him home and nursed him KMR and watter evry 4 hrs with a gel vitamin supplement added as well two Weeks latter he was back to his old self though i did start to notice he has trouble eitehr seeing or with deopth perception as he;s a verry cautious kitty in new surroundings and gets up close to look at things his favorite toys are Vivid color differances like bright against dull or Black and white and he also has issues climbing as an infant he would lay their and cheew his paw untill i rolled him over nad helped him stand up for short periods of time then he;d wobble affter his siblings “crawling” at two weeks his mother we latter found was prone to mastitis. So i wonder Do you think my MIgnon might have had a verry MIld form of this? My cat Dori was “normal” as a very young kitten. From a litter of 2 to a feral mother. She then developed the unsteady gait and shaky head when focusing. The amazing thing is…she has no clue she has this disorder. She has adapted to her life in remarkable ways and keeps her adopted brothers and sisters on their toes! I did take her to a feline neurologist as a kitten. He tried some antibiotics in case it was an infection but it was essentially a wasted visit. Dori can go up and down stairs..climb furniture and beds..and has invented an amazing way of running. At very high speeds outside she jumps very high..flails in the air..lands and repeats. She is also the best mouser of all my cats! The only things we do for her are keep her nails trimmed very long and put padding on the floor if she sleeps up high. It’s nice to read other people’s stories on this condition. Oh..one more important thing about Dori. When she urinates…she wobbles quite a bit. She has learned how to “spray” like a male cat to avoid getting it on herself. You may want to invest in a pan with high sides if your cat does the same. My cat was diagnosed with CH when she was a kitten and from watching the videos on this article, I would say she had moderate to severe CH. I would have to hold her up to eat, walk, etc. She eventually did improve slowly as she got older, and her walk even became like a normal cats. However, she countinuly had problems with balance and was always a little off throughout her life. A few months ago she was diagnosed with severe anemia and a rare blood type which caused her blood to be an almost pink color. She refused to eat and could barely walk from being so weak, and at the vet my fully grown cat weighed four pounds. The vet couldn’t do much except give her iron supplements and antibiotics since she they stated she had probably had these problems since birth. Eventually, she succumbed to her symptoms and passed away. I would recommend that if you have a cat or know a cat diagnosed with CH that they be tested for further health problems that could cause them trouble later in their life. More awareness for this syndrome is always great and this article is wonderful! This was such great information on a condition many cat lovers have never seen and are not even aware of. We adopted a blind cat named Sunny & a CH cat named Snickers from a shelter several months back. Snickers is definitively mild, but she tends to climb more than jump, & the CH becomes more evident if she’s ill or fatigued. The 2 kitties play w/1 another a lot, & Sunny is actually learning things from her & vice versa. My husband & I both have special needs, too–I’m blind & have an inner ear problem, Hubby has a variety of orthopedic challenges. So the kitties just fit right in. We love them dearly. Snickers feels her place at night is in the bed as close to me as she can get lol. How common is feline CH statistically? What percentage of cats have this preventable disease? I am still trying to figure out if our kitten has this she is almost a year old and it seems that head tremors have gotten better…or less frequent but she had them ALOT when she was younger. She’s been doing this twitching sort of thing lately and it almost seems like it irritates her because she doesn’t know how to control it. She can jump up on things but doesn’t always succeed and seems to be better at jumping up then across. What REALLY WORRIES ME is that it seems that this has stunted her physical growth and I haven’t seen much of that as symptoms. She eats a lot….had worms for way longer than most cats…but would that really stunt the muscle growth around her legs and hips? She is only about 5 pounds and is nearing the mark of when she should be full grown. Please help! I have a female kittens who has CH and I was wondering how y’all got your kitties to go potty!? !